I adapted this recipe from Fitness Food , omitting the ham and white wine (didn’t have any on hand — added more shrimp and broth), and replacing the peas with chopped green beans (ditto — use what you got, folks!). I guess you can’t really call this a true paella as it uses long-grain basmati rice instead of bomba or calasparra, but the method is pretty similar, and hey — you cook it in a paella pan. …wait, this is just four servings? Sho’nuff… Fitness Food and Great Bowls of Fire seem to have quite a few of the generous-portion dishes. Wow, that’s awesome. It’s really delicious in my mouth. Well, good, because that’s where it’s supposed to be. I heart anything with mushrooms. Totally! Also, I’ve noticed we’ve been making pretty colorful dishes lately. You know what else I like? Knowing that I’m going to enjoy tomorrow night’s dinner — these leftovers! 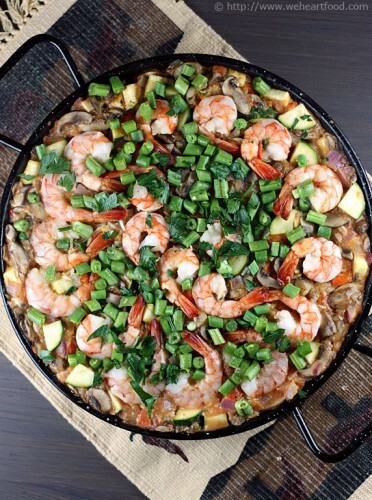 Heat the oil in a deep paella pan at least 12-inches across the bottom and 2 1/2 inches deep. Add the garlic, serrano pepper, and ginger and cook for 1 minute, or until fragrant. Add the onion and red bell pepper and cook, stirring, for 2-3 minutes, or until softened. Stir in the rice, paprika, saffron, and 1/2 cup of the broth. Cook, stirring, until the broth is absorbed. Add the zucchini, mushrooms, and tomatoes. Add the remaining stock (or as much as will fit in the pan) and bring to a boil, stirring continuously. Lower the heat and simmer, uncovered, for 15 minutes. Taste and adjust the seasoning. Arrange the shrimp over the rice, pressing them in a bit. Cover tightly with foil and simmer for 10 minutes, or until the shrimp and rice are fully cooked. Stir in the green beans and top with the parsley. This recipe was recently featured on Serious Eats; it comes from a cookbook titled Almost Meatless: Recipes That Are Better for Your Health and the Planet . I’m all for the occasional veggie burger, but make no mistake: these plump, juicy orbs of joy are NOT vegetarian. Rather, ground lamb is supplemented with steel-cut oatmeal to add bulk — the aim of Almost Meatless is not to eliminate meat all together, but to just use less of it. I haven’t yet tried any of the other recipes from this book, but unless this a one-off standout, I certainly look forward to it! What the — how are these “almost meatless”? Aren’t they made with lamb? Yeah, but only 1/2 a pound in the entire recipe… certainly not “mostly meat”. Ah, okay. I get it. Me neither — maybe rice or something, but definitely not oatmeal. These would be awesome for a tapas party; just stick some toothpicks in them and you’re done. Ooooh, I think we should have one soon! Mix together the oatmeal, cilantro, half the garlic, the chipotle, 2 teaspoons of the cumin, 1 teaspoon of the coriander, 1 teaspoon salt, and 1/4 teaspoon pepper in a bowl. Use your hands to incorporate the lamb into the mixture, distributing it evenly. Form balls out of tablespoon-size scoops of the mixture and set aside. Heat the oil in a Dutch oven over medium-high heat. Add the onion and saute for 5 minutes. Stir in the remaining garlic, cumin, and coriander, cooking for an additional 30 seconds. Add the canned crushed tomatoes and water and stir to combine. Bring the sauce to a simmer and add the meatballs. Simmer partially covered for 45 minutes. Season the sauce with salt and pepper to taste, squeeze the lime juice over top, and serve with extra chopped cilantro. As we neared the end of our week, we still had a few different vegetables left over from ye olde CSA box to use up, and these two recipes allowed us to do that without having to go grocery shopping: we pretty much had the rest of the ingredients on hand. The stuffed vegetables were adapted from a recipe in Moosewood Restaurant Low-Fat Favorites: Flavorful Recipes for Healthful Meals ; the original uses medium-sized zucchini — we only had a few small ones, but we also had a bell pepper that seemed like it would work well to receive the leftover filling. The cauliflower recipe comes from Fresh Spanish: Over 80 Healthy Spanish Recipes , and has a nice bite to it from the vinegar, garlic, and paprika. Leftovers were easily reheated and tasted great the next day. I like these tag-team nights. You mean where we’re both cooking? Same here. Although I could do without having to do half the dishes… ha! Anway, good job on the zucchini boats. They’re really good. I know, I like them! That filling is so delicious with those mushrooms… good idea on using the red pepper to use up the rest of the stuffing. Even if we hadn’t had that pepper, the stuffing wouldn’t have gone to waste; I’m sure we just would have had it on its own. That’s true… this cauliflower rules by the way. Yeah I love the garlic… we should try this same recipe with broccoli and see how that works. Yum… I’m sure it would be just as delicious. Slice the zucchini in half lengthwise and, using a small spoon, scoop out the insides leave a canoe-shaped shell. Slice the red bell pepper in half lengthwise and remove the inner membranes and seeds. Set aside. In a skillet, saute the onions, garlic, and salt in the oil on low heat, stirring often, until the onions soften. Add the mushrooms, dill, sherry, and soy sauce and cook for about 5 more minutes. When the mushrooms are just tender, remove from heat and set aside. Preheat the oven to 350 F. While the mushrooms are cooking, rinse and stem the spinach. In a saucepan, steam the spinach leaves in enough water to cover until wilted but still bright green. Drain and add it to the sauteed vegetables. Stir in the rice and add salt and pepper to taste. Pour the tomato juice evenly around the bottom of an 9×12 inch glass baking dish. 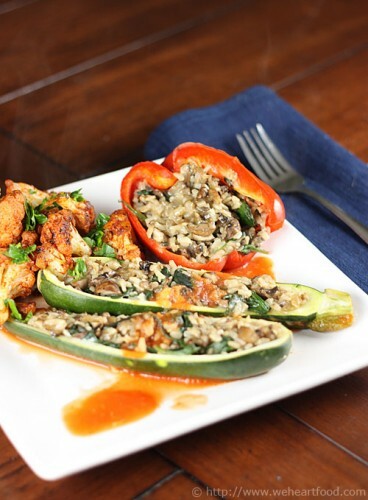 Distribute the filling between the zucchini boats and red bell pepper. Sprinkle on the grated cheese, cover the pan tightly with foil, and bake for about 30 minutes, until the zucchini are tender and easily pierced with a fork. Uncover and bake for another 5 to 10 minutes, until the tops are browned. Bring a large pot of salted water to a boil. Add the cauliflower and cook for 6-8 minutes. Drain and set aside. Heat the oil in a large, nonstick skillet. Add the garlic and cook over a medium heat, stirring for 2 minutes. Add the cauliflower, paprika, and vinegar. Season to taste with salt and pepper. Cook over very high heat, stirring, for 3-4 minutes, then remove to a serving platter. Garnish with parsley and serve immediately. Fideos a la Catalana, and GO OBAMA! 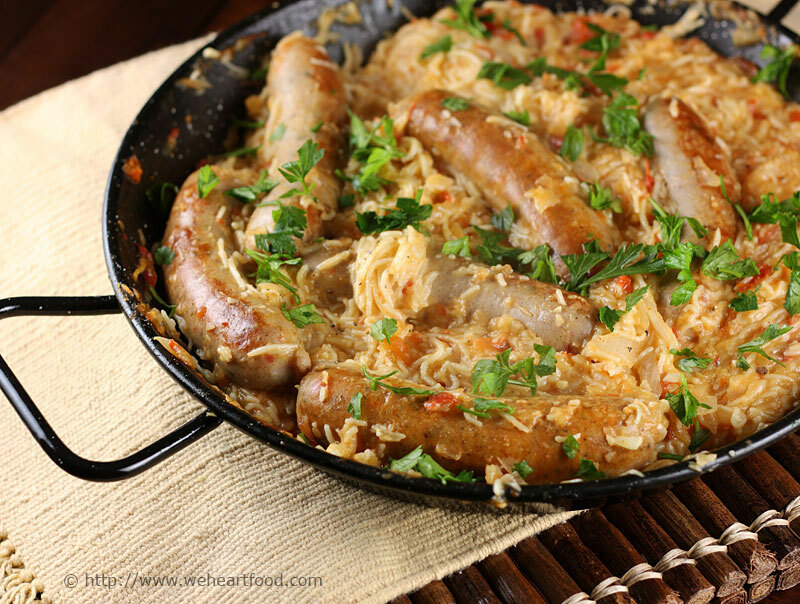 In tonight’s dish, adapted from Fresh Spanish, chicken sausage is cooked with garlic, onions, and tomatoes, and mixed with a short pasta for a hearty main course. Use fideo if you can find it, but if not, vermicelli or thin spaghetti broken into short lengths will work. Well I’m going to complain about this one, but I know how I’d change it. What are you complaining about? I really like the taste. Oh I really like the taste, too. I just think the pasta is way overcooked, so it’s a little mushy. Hmmmm, well, I still like it. So why do you think it came out this way? Two reasons: we didn’t have vermicelli, so I used cappellini, which is even thinner, and there was a bit too much liquid. Also, I’ve seen in other recipes that the pasta is often toasted/sauteed before adding the broth. So you’re saying we’ll have this again, but better? Indeed! And I’m listing the recipe with the changes I’d make. The Change We Need. Wait — what does Obama have to do with this recipe? Not a damn thing. But HOLY CRAP, we just witnessed history. Heat half the oil in a 12-inch shallow casserole or skillet with a lid. Add the sausages and cook over a medium-high heat, turning frequently, for 3-4 minutes or until lightly browned on all sides. Remove with a slotted spoon and set aside. Heat the remaining oil in the pan, add the onion and garlic and cook over a low heat, stirring occasionally, for 10 minutes until soft. Add the pasta and cook for 5 minutes over medium heat until very lightly toasted. Add the tomatoes and paprika, stirring, for 3-4 minutes further. Return the sausages to the pan, add 3 cups of the chicken broth. Season to taste, stir to mix, and bring to a boil. Continue to cook until the pasta is cooked and the water absorbed, adding broth if necessary. Stir and sprinkle with the chopped parsley. Here’s another really easy weeknight dish; we based the recipe on one found in Fresh Spanish. Traditionally, this stew is made with tuna, but any firm-fleshed fish will work. We used mahi-mahi and were very pleased with the results. Capers rule. They’re like little bursts of salt. Arrange the fish in a shallow bowl and salt and pepper to taste. Cover and set aside. Heat the oil in a medium-sized saucepan, add the onion and garlic, and cook over medium heat until softened. Add the tomatoes, bay leaf, bell pepper, paprika, and potatoes, and stir to mix well. Add just enough water to cover and bring to a boil. 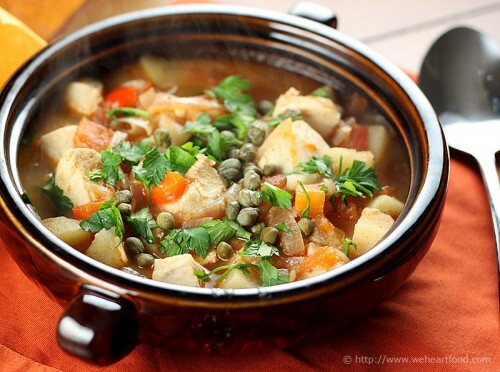 Reduce the heat and simmer for 25 minutes until the potatoes are tender. Add in the fish, return to a boil, and cook for an additional 4 minutes. 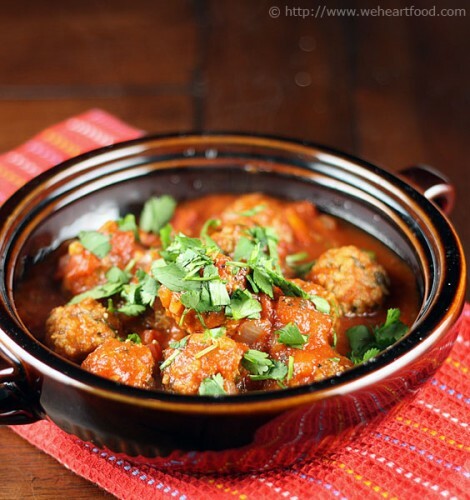 Serve ladled into bowls and garnish with parsley and capers.